There’s no better way to enjoy the spirit of American invention than a visit to Dearborn, Michigan. We also like the idea of a nice hotel, enjoying leisurely breakfasts, pool time, and a long, slow exploration of two of America’s finest historical collections for our vacation. 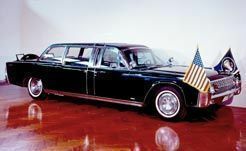 Imagine peering into the 1961 limo that carried President John F. Kennedy to his death in Dallas on Nov. 22, 1963. Much more than just a bunch of cars, Dearborn’s The Henry Ford is a museum founded by the Ford family in 1929 to house inventor Henry Ford’s immense collection of Americana, and to celebrate America’s spirit of ingenuity and innovation. In conjunction with Greenfield Village across the way, these collections make for a remarkably interesting, entertaining and dare we say — educational — weekend getaway. Our family loved it, as you can see in FTF’s coverage of Family-Friendly Detroit and Environs. And since this seems to be the year of the family road trip, there’s no reason not to celebrate cars. Which brings us to this top value family getaway offer. The very classy, 23-acre The Dearborn Inn, A Marriott Hotel offers an ideal locale near downtown Detroit and the Detroit Metropolitan Airport. The Inn was built in 1931 on the grounds of Ford Motor Company. In a setting reminiscent of a classic, small-town B&B, this hotel boasts a multi-million dollar renovation and features the facilities and full service expected of a Marriott. Recently redone restaurants have a historic bent too: Edison’s honors the original Albert Kahn-designed architecture while offering a revised layout and fresh furnishings; and the casual Ten Eyck Tavern is a new interpretation of one of Dearborn’s original outposts dating back to the early 19th century. A unique array of accommodations includes the Main Inn, two Colonial lodges and five Colonial guest homes. Amenities include on-site fitness center, outdoor swimming pool and several nearby golf courses offering ample leisure activity close to major corporations and cultural sites. The Early American Room raises the bar for Dearborn hotel dining, while two other eateries serve classic American cuisine. Vacation planners should consider that this beautiful and historic hotel is just three blocks away from the Henry Ford Museum and Greenfield Village, and nearby the Rouge Factory — where kids can get a factory tour of Ford trucks on teh assembly line. — Breakfast for two at The Dearborn Inn; kids’ rates available in the restaurant. The offer is valid until June 1, 2011 with rates from $169/N to $319/N depending on date and accommodation. Some hotel rooms have two doubles, and there are small suites with a double bed and pullout sofabed on the Concierge Level, whose extra perks and snacks make them a good family value.